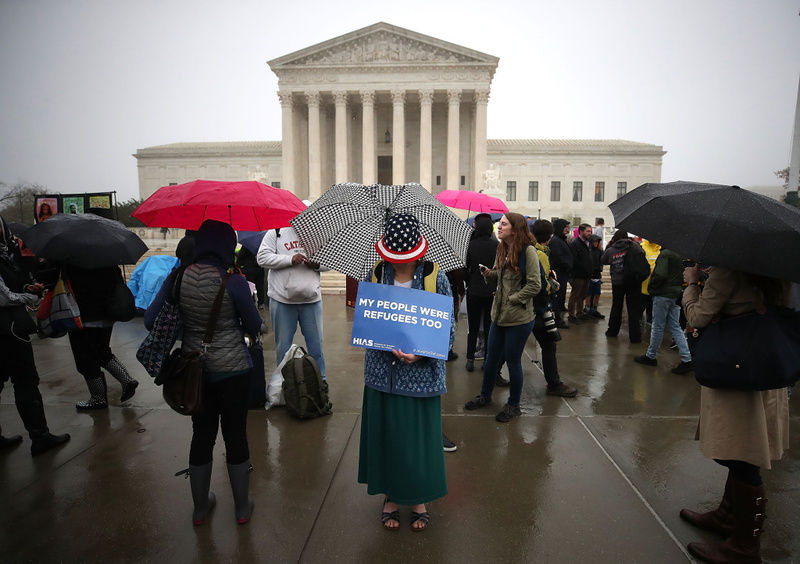 People gather to protest President Trump's travel ban in front of the U.S. Supreme Court, on April 25, 2018 in Washington, DC. The proclamation was "squarely within the scope of Presidential authority under the INA,'" the court wrote in its majority opinion, referring to the Immigration and Nationality Act. The court seemed to tip its hand at oral arguments in April, when a majority of the justices appeared ready to side with Trump. The court was ruling on what was the third version of the ban, which Trump has complained is a "watered-down" version. The court allowed it to go into effect while the case was litigated, but the lower courts had ruled that all three versions either violate federal law or are unconstitutional. Like the earlier two bans, Version 3.0 bars almost all travelers from five mainly Muslim countries, and it adds a ban on travelers from North Korea and government officials from Venezuela. Today on AirTalk, our constitutional law scholars lay out how the justices reached their decision, what the dissenting minority argued, and look ahead to what the effects of this ruling might be. US budget watchdog projects record US debt, is the economy doomed?